FAIRHAVEN, MA: Originally owned by oil-tycoon and Fairhaven benefactor Henry Huttleston Rogers, Crow Island is part of The Town of Fairhaven and was valued at $150.00 according to assessors records around 1905. According to the caption below Crow Island was purchased from Alfred Wing of 51 William St., Fairhaven, by E. Anthony & Sons, Inc., publishers of The Standard-Times, Mercury, and owners of WNBH. transmitter to be built on Crow Island. An impressive landmark from sea, sky and shore will arise on Crow Island when radio station WNBH constructs new transmitting headquarters on the little isle in New Bedford Harbor. Application was filed today at Fairhaven Town Hall for a permit for the construction of a 375 foot steel tower. A Cape Cod style building will house the control room and a boat landing also will be built. Irving Virmilya, manager of WNBH said the new transmitting setup will make WNBH "the most efficient station of it's size and power" in The United States. Improved transmission will result., he said from two main factors. First, the location near salt water creates a good "ground" connection. Second, the projected new aerial tower is twice as high as those of the usual type for similar circumstances. 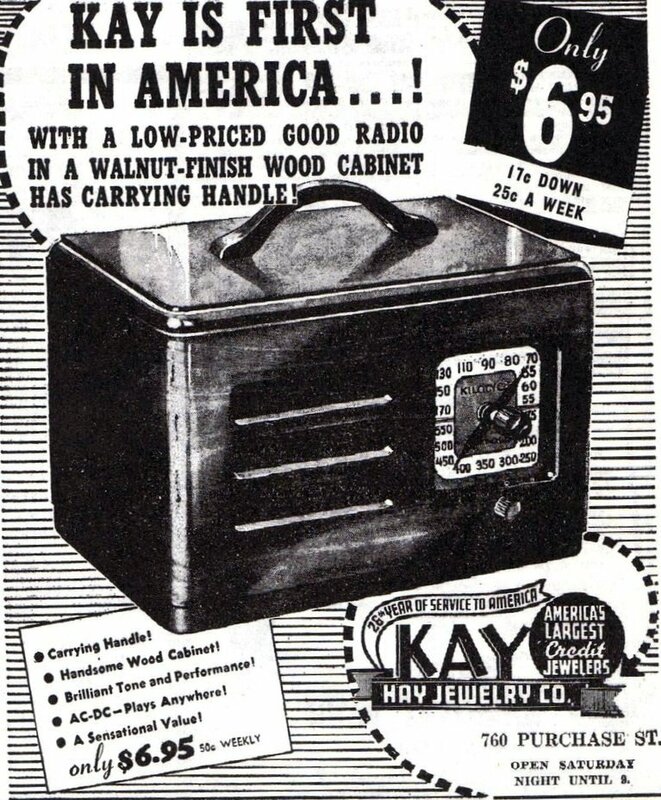 (above) Standard-Times ad in 1940 for a car radio. Roughly, a transmitting tower may be compared with a lighthouse whose beams may be seen over a greater area without being increased if the height of the lighthouse is increased. A"taller" tower will make WNBH's signal stronger over a wider area the waves being sound rather than light. The island site of the new transmitting headquarters, which will be located 1,150 feet from the foot of Washington St in Fairhaven. 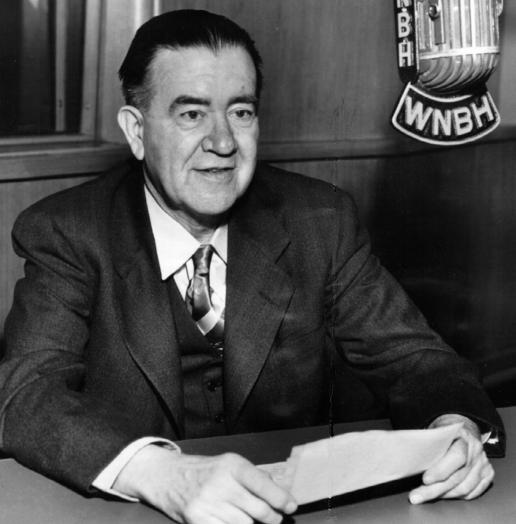 According to Wikipedia, WNBH is one of the oldest broadcast radio stations in America (claiming it's the 11th oldest although that can be disputed), dating back to 1921. 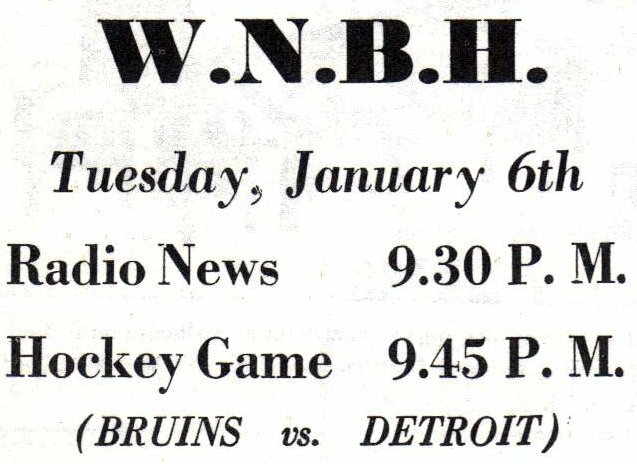 At one time WNBH had its studios at the New Bedford Hotel where it derived its callsign. 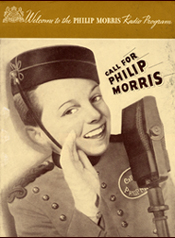 In 1948 WNBH added FM service with WNBH-FM on 98.1 FM. Station engineers Irving Virmilya and Ivan Whitehead were at the control room on the island when they noticed the tower mast head light go out and then heard a "terrific clattering outside" as 235 feet of the towers steel crashed to the ground "just five feet away from the door"., at 11:16PM. Only 120 feet remained of the newly installed 4 year old structure. Technicians set up an emergency antenna on the mainland and began broadcasting by 8:30AM the next morning. 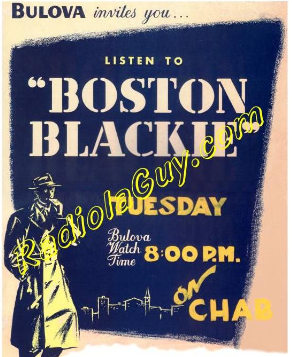 WCOB Cape Cod's first commercial radio station signed on the air in 1941. It's newly installed transmitting tower in West Yarmouth met the same fate, ironically with a similar structural failure near the base. 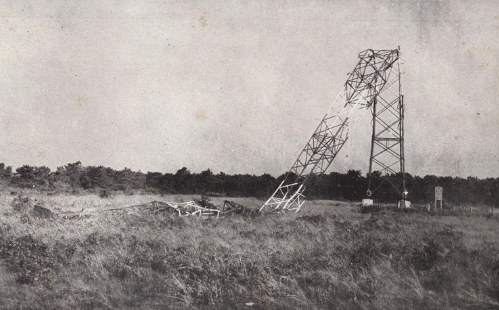 Hurricane Carol, August 31, 1954 smashed the entire tower into the ground. Bill Brennan of WBSM radio located on Pope's Island nearby witnessed the tower keel over from his radio station about a half-mile away. Trapped on Crow Island with huge waves breaking over the building in which he huddled, Leo Brunette, Station WNBH-WFMR engineer, was rescued at 3:30PM yesterday afternoon. Brunette made a dramatic description of the station's last minutes on the air before the Crow Island tower broke off at 11:15 AM at the height of the hurricane. Only company Brunette had in his watery fortress was three large fishing vessels which went aground on the tiny island., they included the Mary J. Hayes, Fleetwing and the Vivian and Fay. By 3:30PM the WNBH power launch was able to reach the frightened but otherwise unharmed engineer. The station went back on the air at 5:42PM with an improvised antenna made by stringing a wire from the AM transmitter on the island from the Conelrad pole and then to the frame of the large electric WNBH sign on Crow Island. WNBH officials have notified the FCC that they are operating on a temporary basis and will continue to do so "at least for several days or until a new tower is erected". Officials said that the temporary set-up is "broadcasting a good signal"
There are no records indicating any significant structural damage to the tower after Hurricane Donna struck in 1960. Hurricane Bob arrived on August 19, 1991. Wind gusts reached 125 MPH at Block Island, Rhode Island and 106MPH at The New Bedford Hurricane Barrier. "With winds coming in almost directly from the east, the flat side of the triangular-based tower bore the full brunt." said Peter Jarosik KA1WBE - tower site engineer. In the YouTube clip above, this was probably the last video taken of the tower in September 1990. Peter Jarosik - KA!WBE, a life long water front fixture in New Bedford Harbor was also a live truck operator at ABC-6 News Providence RI. He designed and built the tower of The West Island Weather Station and now resides in Florida. 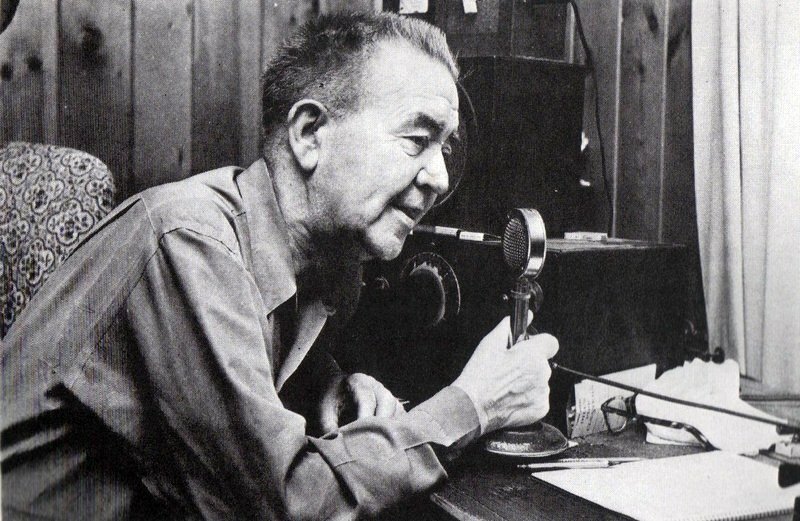 Jarosik; was one of the last commercial radio providers that utilized the tower after WNBH stopped transmitting from it in the mid-1970's. Because of it's 391 ft height the tower still was a very favorable site for transmitting commercially. 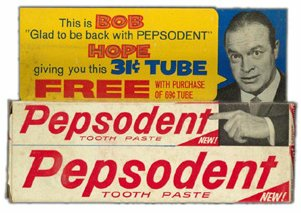 Pete recalled fondly, that as a kid he brought over the site engineer of WNBH by boat to the island to service the gear. "An RCA transmitter put out a 1,000 watts during the day and 250 watts at night. The entire tower emitted the signal and was isolated from the ground. A web of ground cables in the salt water equivalent to height of the tower made for a superior ground plane." Jarosik said. During windy days you look up from the transmitter sheds roof to the top of the tower and see it slightly sway. The steel self-supporting structure was designed to withstand a sustained 89 mph wind. 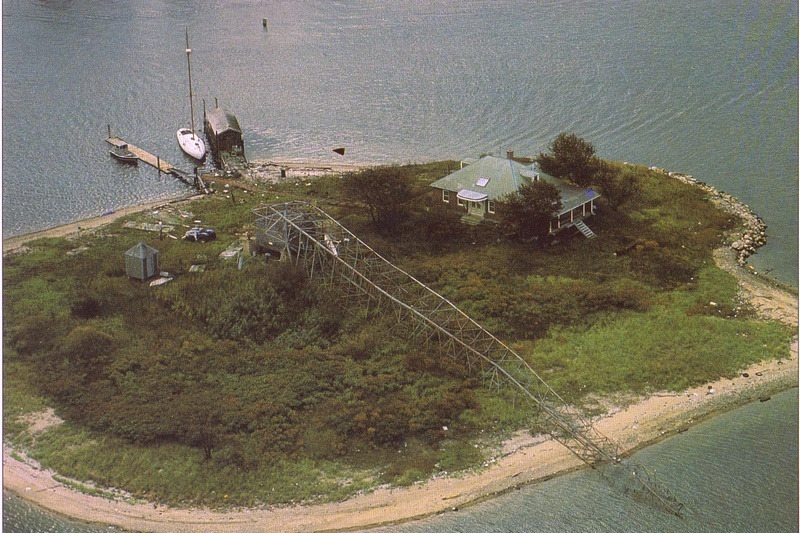 On Monday, August 19, 1991, Fairhaven Police Officer Richard Claflin witnessed the entire tower slant over for a few seconds and then it slowly gave in as it collapsed into the Acushnet River about 1:30PM at the height of the hurricane. Crow Island in New Bedford harbor. I was one of the last amateur operators to transmit from the tower before it went down. I was also a live correspondent for WNBH that day. WNBH was the only radio station left on the air during the storm. The station was transmitting from it's County St, New Bedford location. Bernadette Coelho, Keith Thibeault were out in the field as well with Jack Pedersen at the news desk. 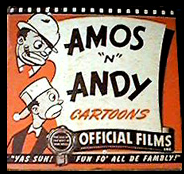 The radio station received The Associated Press Award for Outstanding Coverage of a Live News Event that year. This clip was taped during the storm of the WNBH broadcast when the power was out. The tower was never rebuilt. There was discussion of replacing it, but with the advent of newer communications and cellular phones, the estimated one-million dollar price tag was not practical. Today, the island is privately owned by a local restauranteur and the original radio control room building remains intact as a residence.